We’ve been hearing for years now that, ‘this is the year of mobile’ and some people are still saying it. The things is, the ‘year of mobile’ has passed and mobile is now part and parcel of our everyday lives. Are you mobile ready? 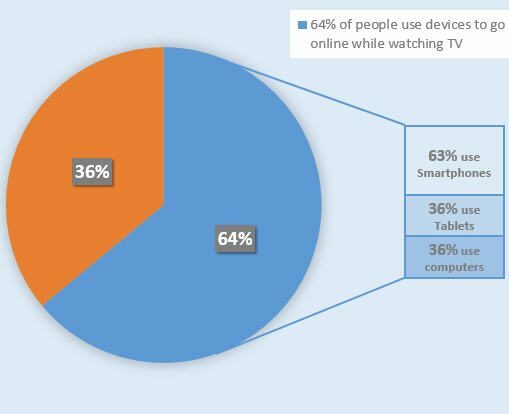 Well, according to recent studies carried out by Google, in The Connected Consumer Survey 2015, 1 in 4 people are accessing the web through a smartphone, while watching TV. 71% of British consumers own a smartphone and 64% of people are going online while watching TV. Of that 64%, 63% of them are going ‘on the line’ using their smartphone. You may be wondering what this has to do with the small business? After all, these are probably just teenagers looking up stats about their favourite actor or actress – but Google’s study was quite in depth and it cites that 32% of people are accessing their smartphones to look for product information, 38% are watching online videos, 60% are checking email and 60% are using search engines. That’s four opportunities for your business to be front of mind! To top that off, 75% of the audience doing product research through their smartphone is over 25. What do we know about the habits of people researching products in the UK? 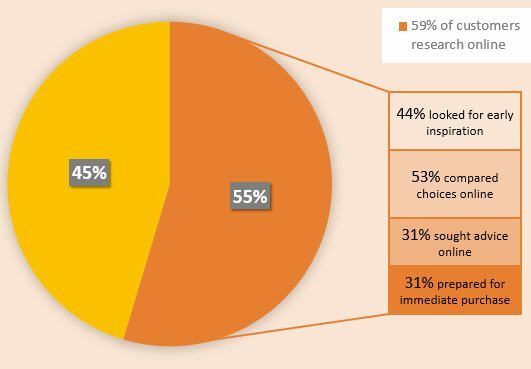 We know that 59% of people do their research online (and 25% of people only research online in the UK), compared with 49% who do their research offline. 1. Be there to inspire – 44% of people are looking for early inspiration, be there in the awareness and pre-awareness stage of the buying cycle by using banner advertising, in-app advertising and social. 2. Be informative – 53% of people are comparing their choices online so tell them what they need to know by writing an effective product description. Why is this product better than others on the market? Why should they buy from you and not someone else? 3. Be an expert – 31% of people are seeking advice and you need to ensure that you can tell them everything they need to know. This is a tricky subject for a lot of people and there are hundreds of articles about the best way to do more content marketing effectively – do it right and you’ll kill two birds with one stone, because you will likely end up ranking higher on Google. Use videos on your website as well as an advice centre or blog spot. Be open, honest and transparent as much as you possibly can. 4. Be online – if your product or service suits it, make sure people can buy it or book it online. You may think that people will come to your shop if you’re friendly and local but chances are, they won’t. They’ll buy online if they can. If I can get something delivered to my office, a locker or to home without trudging outside in the rain or speaking to someone on the phone, I will do that – and I’m not the only one. Make sure your product or service can be bought or booked online. 5. Be mobile – 52% of people experience issues when accessing websites via their smartphone and 24% find another website that works better on their smartphone. Don’t just think mobile, think tablet too, responsive design is key – some of the best, big brand sites struggle to make their site look good for tablet devices and it can cause people to buy elsewhere. The important takeaway from this is “Get mobile ready!” – it’s so important to your business. Mobile is here and it’s not going away, so make sure you’re not losing out!